SuperPhillip Central keeps on rolling review-wise this month, as does the Summer of 700. While we won't quite reach that milestone THIS month, NEXT month will be something even more special! For now, let's turn our attention to last year's Skylanders SuperChargers. With Imaginators coming out this year and all the hype around Crash Bandicoot being in it, it seemed like a smart time to try out the game's predecessor. Here's SuperPhillip Central's review of Skylanders SuperChargers. Update: @SP_Central Twitter follower @Trev_G1 (Trevor Gould) let me know that you don't need the air or sea figurines to beat the game. You can actually skip the segment I was talking about in the last level. I apologize for the error! The grade remains the same, however, as the figurine "problem" didn't heavily weight on the overall grade. This year, the first competitor saw its exit from the toys-to-life arena with Disney Infinity calling it quits. This made gamers and fans wondering what the future was for other games that revolve around figurines for their gameplay and thus, their success. Well, if Activision's Skylanders series, now at its fifth game with Skylanders SuperChargers, can continue to be as well rounded and engaging as the latest game in the series, then fans have nothing to worry about. Skylanders SuperChargers, of course, brings back the toys-to-life concept that Activision's series helped spearhead, thus bringing us competitors from LEGO to Nintendo. However, I still maintain that Skylanders has the best use of toys-to-life concept to date. For those unaware of what toys-to-life entails in regards to Skylanders SuperChargers, the game comes with a portal known as the Portal of Power. Here, you place figurines on them to bring the characters into the game. With SuperChargers, you need to place two figures on the Portal of Power at once: one Skylander and one vehicle. Depending on your vehicle, whether land, sea, or air, you can access different challenges within levels. While I had thought this was optional to play the game as sea and air missions aren't required throughout most of SuperChargers, I ended up being required to have a sea and an air vehicle for the last level. So, yeah, that's a bit of a bummer-- playing through the entirety of Skyalnders SuperChargers just to end up having to buy two extra vehicles to beat the game. No mere minion is a match for Spitfire! The Skylanders you place on the Portal of Power are what you control through the game's 13 levels. Through defeating enemies as a given Skylander, your character earns experience points. Earn enough points and your Skylander levels up, giving them more health and strength. If your controlled Skylander loses all of his or her health, you need to replace them with a different Skylander until you either finish the current level or start it from the beginning. You'll have to do the latter if you run out of Skylanders with health. Some Skylanders have long range attacks, because why get all up close and personal? Each Skylander can pick up coins, giving them their own separate total instead of every Skylander pooling their collecting coins into one pot, if you will. These coins at certain spots of the game allow you, the player, to purchase new moves for them, helping you contend with enemies more easily in battle. As the moves become more complicated and worthwhile, the prices go up. There's also branches that make you choose between moves of one style over another. Skylanders SuperChargers is part action-adventure platformer and part vehicular combat and racing. The action-adventure parts sport a modest amount of platforming as well as a camera that follows your Skylander around without relinquishing control to the player. This mostly works well, as the camera is far enough away that you can go backwards in levels, towards the camera, without the fear of getting hit by an off-camera enemy or falling into a pit. Meanwhile, the vehicle segments either put the camera behind your vehicle racing-style as you speed along a road, usually needing to avoid some kind of series of hazards in the process, or they put your vehicle in an arena-like setting. The arena segments are a little harder to control, as the camera is at an isometric view with the vehicle controls taking some getting used to. Meanwhile, the flight segments are brilliant, offering either normal or inverted controls depending on players' preference. The 13 levels within Skylanders SuperChargers are well executed and constantly bring new variety into the fold. One level had my Skylander growing to the size of a titan to level buildings and tower around a tropical series of isles with ease, while another had segments where it turned this normally 3D game into a 2D side-scroller. Dive-Clops only needs one eye to take out enemy minions. 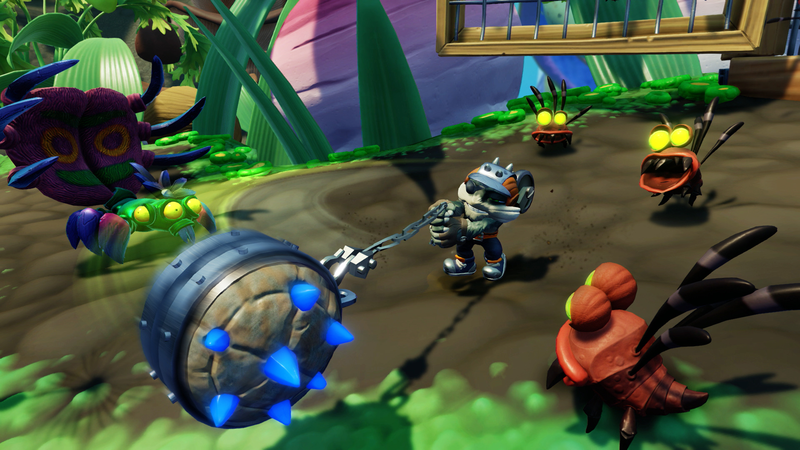 In-game collectibles are an important part of Skylanders SuperChargers to add even more longevity to the game. There are things like hats that a Skylander can wear for increased stats, vehicle modifications that add both aesthetic and statistical changes to your rides, and legendary treasures that can be placed around the hub world of SuperChargers, Skylanders Academy. 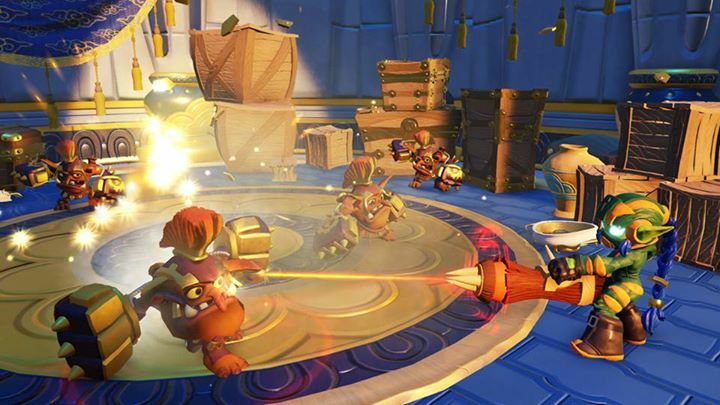 Outside of the main campaign, there is plenty more to do in Skylanders SuperChargers. The main extra mode is a Mario Kart-style racing mode, complete with six initial, well-designed, tracks (six more needing to be unlocked by figures). Starting off, both race mode with up to seven other AI players or three other human players online or locally as well as a time trial mode are available. With different figures in the form of trophies, extra content like boss battles and grand prix events are unlocked. Regardless, the racing is absolutely aces, offering item-based combat where you try to whittle down the health of an opponent's vehicle to slow them down while trying to avoid enemy fire as you race through an elaborate set of courses. The racing could be its own game-- that's how good it is. ...Wait a minute. The other extra in Skylanders SuperChargers is the return of Skystones, a collectible card game that is a cross between Magic the Gathering and Hearthstone. This uses cards gathered throughout the game from treasure chests or through won games, and using them to attack your opponent's cards and overall health until it is emptied to nothingness. 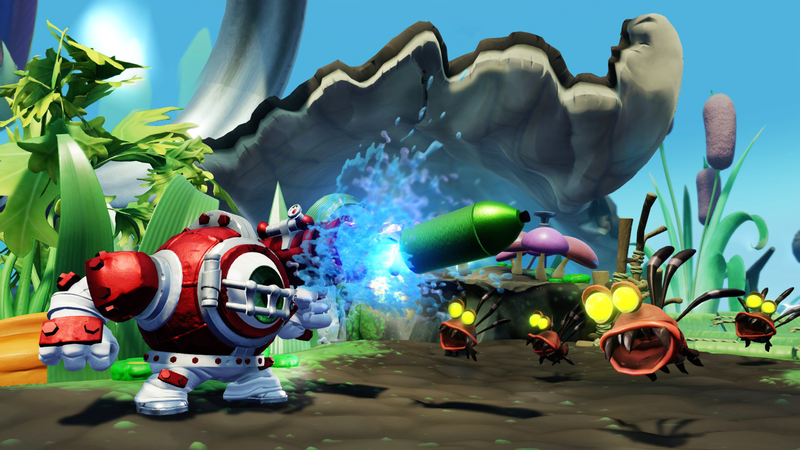 Skylanders SuperChargers is a very pretty game with a tremendous art style and design to it. Characters exude personality and charm, environments are well detailed and original, and everything runs smoothly. The PS3, 360, and Wii U versions sport longer loading times when compared to the PS4 and Xbox One versions, but other than that, all versions of Skylanders SuperChargers play well. The voice acting is pure Saturday morning cartoon goodness, played off well and presenting lots of humor for both kids and adults like me. The music is joyous to listen to, relaxing to explore levels in at some times while dramatic when it needs to be at others. Smash Hit's next record is how many of these insects he can exterminate at once. 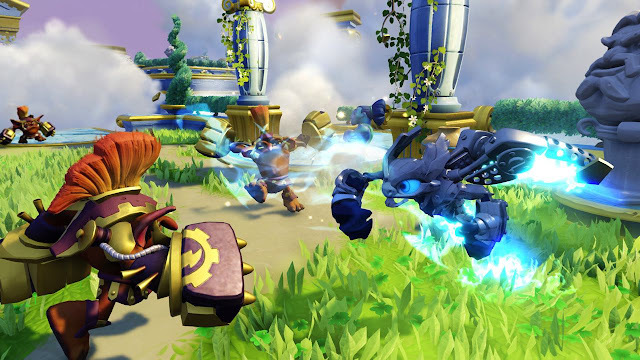 Overall, Skylanders SuperChargers makes the case for the series' longevity. After now five installments, the series successfully keeps adding to itself and changing things up just enough to stay both rewarding and satisfying. Being able to use all of the figures from past Skylanders games means you don't have to pick up new ones just for this game (apart from vehicles), unless you're like me and are just a collecting freak who can't help himself! You can even use a Portal of Power from past Skylanders games as well. 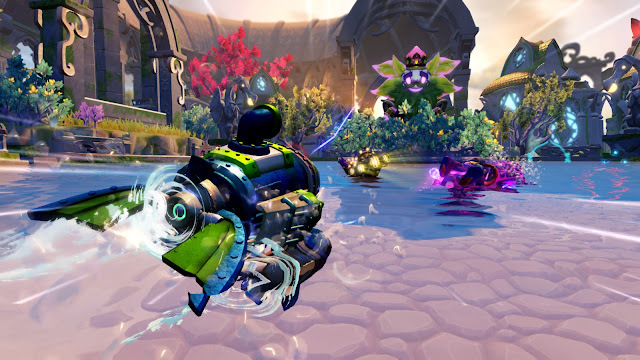 While being locked out of air and sea content is annoying, and the occasional troublesome camera angle can mean some annoyances here and there, ultimately, Skylanders SuperChargers is a really fun game that both kids and adults can love and cherish.